Cactus phyllanthus Vell. non L.
Fl. Flumin. Icon. Illustrations: 208, 5: pl. 33 (except flower) 1831. Accepted Scientific Name: Epiphyllum phyllanthus (L.) Haw. 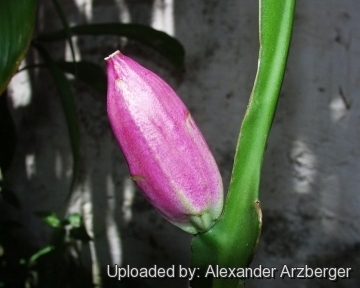 Origin and Habitat: Epiphyllum phyllanthus is a widespread species growing throughout Latin America from Colombia in the north southwards to Argentina. Countries: Argentina; Bolivia, Brazil (Alagoas, Bahia, Ceará, Espírito Santo, Minas Gerais, Pernambuco, Rio de Janeiro); Colombia; Ecuador; French Guiana; Guyana; Paraguay; Peru; Suriname; Venezuela. It is not present in Mesoamerica or the Caribbean (Cuba). Altitude range: This species grows near sea level to at least 1,300 m asl. Habitat and Ecology: Epiphyllum phyllanthus is extremely common, if not the most abundant, cactus species that can be found in a wide variety of habitats. It grows as an epiphyte in mata atlântica, caatinga-agreste, mata do planalto, mata ciliar and cerrado, as well as in mangrove habitat). It occurs in wet forests. The flowers opens at night and have a strong fragrance exuded during the night. Both these features are correlated with hawkmoths or other moths pollination. Moreover, because the nectar is at the base of a very long, slender floral tube, the hawkmoth is probably the only pollinator capable of reaching it. The fruits are pecked open by birds and eaten other arboreal animals that disperse the small sticky seeds. The seeds, which must germinate on trees branches, are most ideally suited to bird dispersal. 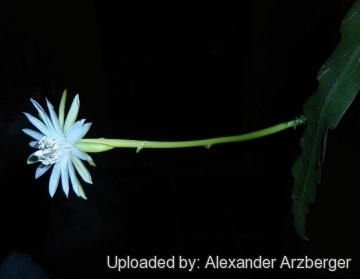 The frequency of Epiphyllum phyllanthus has been reduced due to deforestation in parts of Brazil. Nevertheless, it is still very widespread, extremely common, and fairly tolerant of disturbance, as it is found growing on trees in the middle of cities. Rhipsalis phyllanthus (L.) K.Schum. in Mart. Epiphyllum phyllanthus var. boliviense (F.A.C.Weber) Backeb. Epiphyllum phyllanthus var. columbiense (F.A.C.Weber) Backeb. Epiphyllum phyllanthus var. paraguayense (F.A.C.Weber) Backeb. Cactaceae Syst. Init. 17: 25 2003. 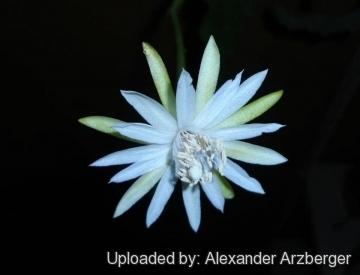 Description: Epiphyllum phyllanthus is a much branched epiphytic cactus, with thin and leaf-like stems segments, sometimes 3-winged. 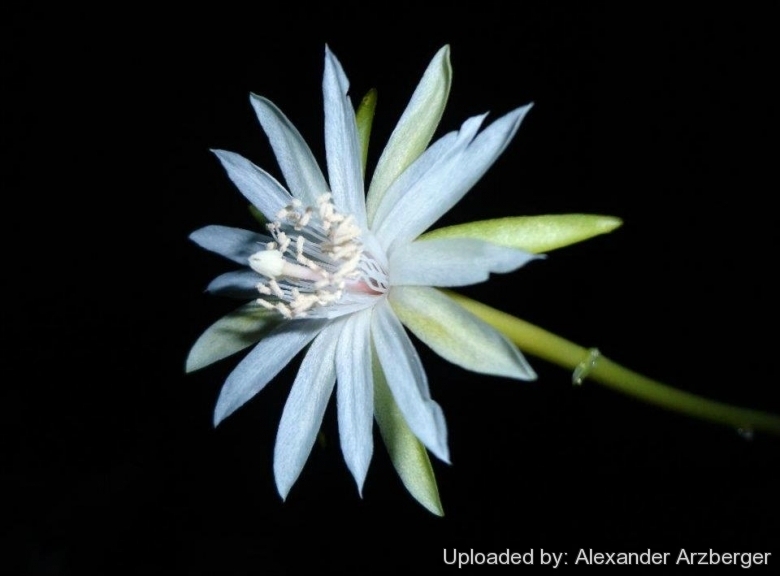 The flowers are slender and scented, up to 30 cm long, white in colour, nocturnal and sweetly scented, the flower-tube is greatly elongated (much longer than the limb). The epiphytic, leafless aspect of these plants makes them hard to confuse with other cactus species. Two subspecies are recognized, the nominate form and subsp. rubrocoronatum (Kimnach) Bauer. Stems segments: Primary stems round elongated, terete in cross section or 3-angled below for 50-100 cm or more, often branched, then flattened for 100 cm. Joints (secondary stems) arising from the flattened portion of the primary stems, round in cross section to three-angled basally for only 2 cm, then flattened and linear, for 25-50 cm long, 3-10 cm wide, light to medium green with a very definite purple margin, stiff to flexible, with prominent midribs, marginally lobed and toothed, the teeth obtuse. Areoles: Small, borne along the margins of the flattened branches sometimes with hairs, usually with only cream-coloured wool. Spines: Wanting in mature plants, but represented in seedlings and juvenile forms by slender bristles. Flower slender: 7,5 to 30 cm long, 4.5-23 cm in diameter, borne on flattened portions of the stem. The slender perianth-tube much longer than the limb (2 to 9 times longer), straight on erect stems, and strongly curved on pendent stems. Outer perianth segments greenish yellow tinged with red, inner perianth segments narrow 2.5-10 mm broad, white to cream. Scales on flower-tube few, minute, spreading. Filaments short. Style long, slender, rose-pink or white. Stigma-lobes about 10 short, white. Fruit: Ellipsoidal to ovoid, 3 to 9 cm long, smooth, somewhat 8-ribbed, bright red to purple; pulp white, sweet and sticky. Epiphyllum phyllanthus var. boliviense (F.A.C.Weber) Backeb. : has wider stronger stem, and flowers much larger and inclined to be luminous. Beautiful scent. Distribution: Bolivia. Epiphyllum phyllanthus var. columbiense (F.A.C.Weber) Backeb. : has smaller flower than the species- to about10 cm long -short tube with pinkish style having 5/7 white lobes. Distribution: Colombia, Ecuador, Costa Rica and Panama. Epiphyllum phyllanthus subs. rubrocoronatum (Kimnach) Ralf Bauer: has long slender branches, flowers with orange filaments, larger style which is pinkish-orange below and deep red or purplish above with 10/13 orange lobes; tepals 4-5 cm long; fruits 4.5-7.5 cm long. Distribution: Panama, Colombia and Ecuador. Notes: The name "epiphyllum" refers to flowers that grow on the leaves. Actually, the flowers grow on the stems and branches that function as leaves. Original Epiphyllums have not exciting colours, but they have been widely hybridized with other cacti to produce modern varieties with colourful day-blooming and long-lasting flowers. There are over 13,000 registered hybrids in every colour but blue. Flowers range in size from few cm wide miniatures to 25 cm (or larger) giants. Because of all the crossing of species and genera for the epiphyllum market, there is confusion about the naming of plants. Scientific names are always italicized, while the hybrids are referred to as Epiphyllum hort. followed by the cultivar name. Most growers and collectors simply call all their plants “epis”. It is easy to produce hybrid seeds by taking pollen from the anthers (male) of one flower and transporting it to the stigma (female) of another species. New plants from these seeds may be surprisingly different from either parent (Barbara J. Euser 2005). 4) Ponce, M. “Distribución de cactáceas en Venezuela y su ámbito mundial. Facultad de Agronomia, Universidad Central de Venezuela.” 1989. 5) Taylor, N.P. and Zappi, D.C.“Cacti of Eastern Brazil.” Royal Botanic Gardens, Kew. 2004. 6) Vegas-Vilarrúbia. “Zonation pattern of an isolated mangrove community at Playa Medina, Venezuela.” Wetlands Ecology and Management 8: 9-17. 2000. 7) Taylor, N.P., Machado, M., Zappi, D., Braun, P., Pin, A., Oakley, L., Loaiza, C. & Ostalaza, C. 2013. Epiphyllum phyllanthus. The IUCN Red List of Threatened Species 2013: e.T46520A3007732. http://dx.doi.org/10.2305/IUCN.UK.2013-1.RLTS.T46520A3007732.en. Downloaded on 07 July 2016. Cultivation and Propagation: Epiphyllum phyllanthus is easy to grow and tolerates neglect. This plant (as with all Epiphyllum) prefers partial shade, and requires ample summer water (more than other cacti), but allow soil to dry slightly between waterings. Growth rate: These forest cacti are fast growing and tend to be long lived. Exposure: It grows well in full sun or light afternoon shade. Shade is sometimes provided in hot climates. Extra light in the early spring will stimulate budding. Soil: Epiphyllums aren't usually too picky as to soil type, but because of their epiphytic nature, it is recommended to grow them in well-drained soil mix largely composed of organic material, such as peat or sphagnum moss. This type of soil would normally be used for orchids, bromeliads or other epiphytic plants. Waterings: During the growing season (March-August), the plants are watered on a regular basis, making sure that they never dry out completely. They are fertilized on a monthly basis with a balanced fertilizer during this period. In late August, water is restricted to about once a week until January. Night temperatures at this time should be about 10° C. In January or February, watering is stopped for a period of 4 weeks to aid in flower formation. In March, regular watering is resumed and the plant will flower in 6 to 8 weeks. Remarks: These plants drop their buds easily if they are moved. Once flower buds have formed, DO NOT MOVE the plant, as slight changes in environment may cause the buds to drop. Hardiness: Prefers nighttime temperatures no cooler than 12° C, especially in the winter. Will tolerate temperatures to 45° C, and short periods of frost, but prolonged cold will damage or kill the plant. Protect from frost. Pests and diseases: Usually remains remarkably free from disease. Propagation: The plant is easily propagated from the leaflike stem cuttings or (rarely) by seed in the spring. Seed should be sown in well-drained compost and should germinate in 14 to 28 days at 18 to 21° C.